The SCI has diversified into the Indian Offshore marine business and provides vital offshore marine logistics support to the Indian oil industry in its indigenous oil exploration activities. 1) The SCI provides vital offshore marine logistics support to the Indian oil industry in its indigenous oil exploration activities. 2) SCI owns 6 Anchor Handling, Towing & Support Vessels (AHTS), 2 Platform Support Vessels (PSVs) and 2 Multi-Purpose Support Vessels (MPSVs), which are chartered to various players in the Indian offshore industry. The clients can expect availability of vessels for offshore logistics support with minimum agreed downtime. Towing & Anchor handling operations in Offshore. Carriage of men and materials (fuel oil, bulk cement and barite, deck cargo, refer cargo, pot water, drill water etc.) between base and offshore installations as well as between Offshore installations. Carry out standby and rescue operations in offshore, if required. 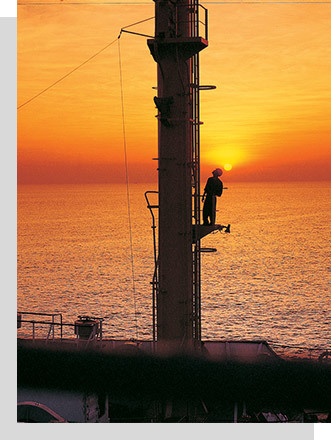 Carry out routine surveillance in offshore for safety and security reasons. Standby at SBM Tankers in Offshore. Carry out Fire Fighting duties by FIFI vessels. 4) If the agreed service standards have not been fulfilled, Client may take up the matter with the concerned Group of Offshore Department. If the problem persists, then the client may take up the matter with Vice President I/C (OS & TS-F).